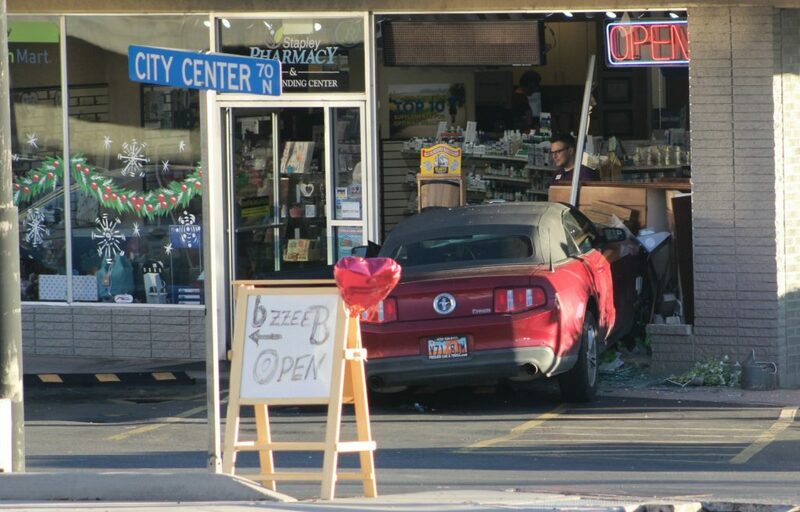 ST. GEORGE — A Ford Mustang went crashing through the front windows of Stapley Pharmacy on City Center Street Wednesday afternoon. 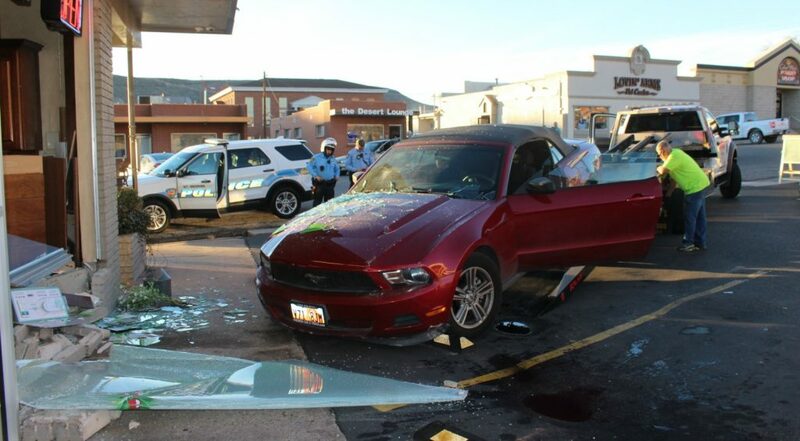 At 4:20 p.m. officers responded to find the Mustang partially lodged inside of the business located at 102 E. City Center St., St. George Police officer Andy Mickelson said. 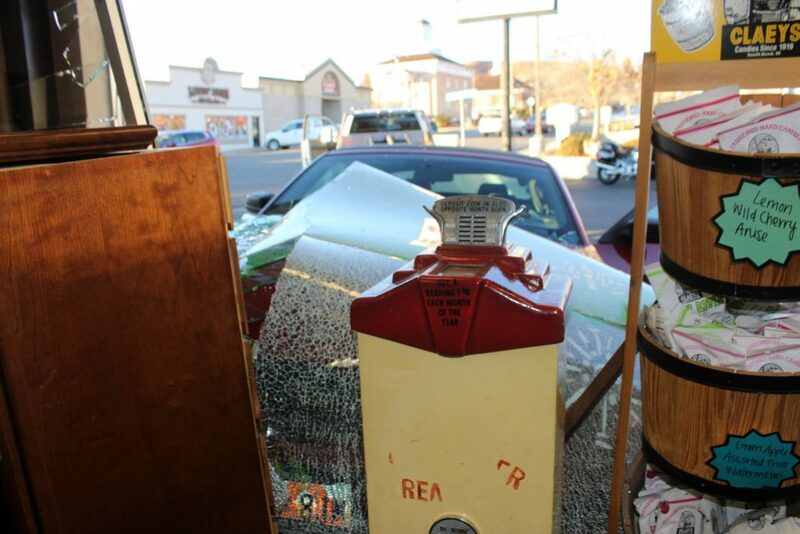 Officers also found glass, wood, drywall and other debris scattered throughout the scene, and a driver who reported she was uninjured during the incident. 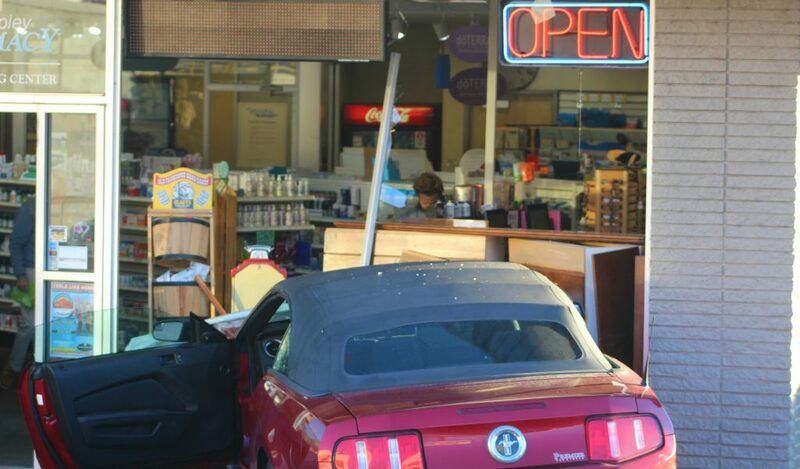 It appears the woman pulled up to the front of the store and the Mustang then jumped the curb and crashed through the window. The driver may have pushed on the brake and the gas at the same time, one witness said, but that was not confirmed by police still investigating the scene. 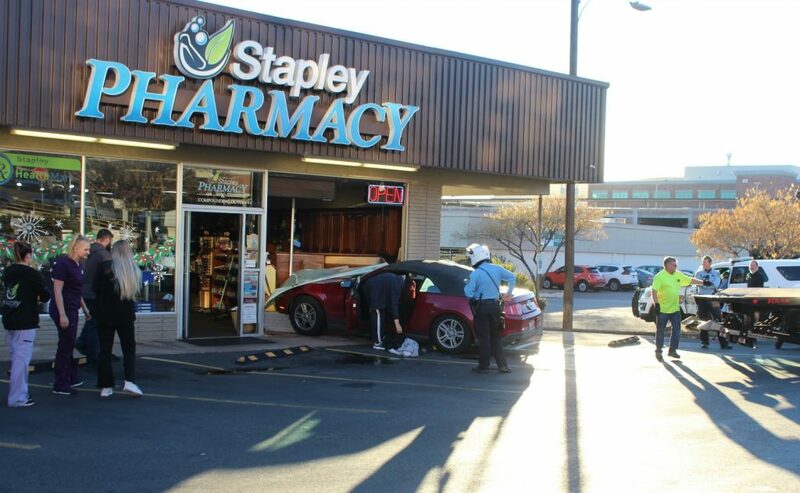 Three pharmacy employees were in the front of the store when the incident took place. Two were just feet from the front window seconds before the vehicle came through. Brad Stapley said he was in the back of the store when he heard the commotion. He said this isn’t the first time a car has driven into the store. About 15 years ago a Ford Bronco drove into the front of his store under similar circumstances. 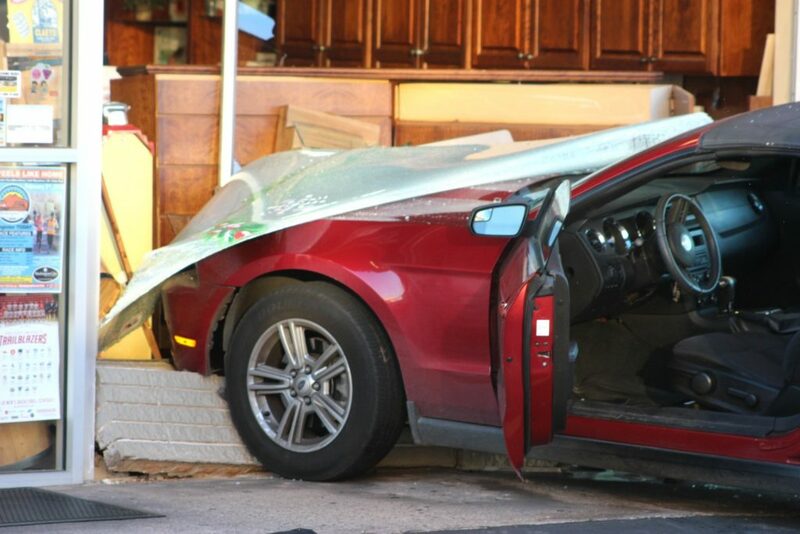 “This time it’s a Ford Mustang, so maybe there’s something about Fords,” Stapley said. He added that the incident could have been worse had it not been for the recent retrofitting of the building’s windows with security film designed to deter break-ins. It is strong enough to withstand repeated blows from a bat or other object, which can delay entry by as much as 45 minutes. It will also hold a shattered window together, a claim supported by the large slab of broken glass lying across the floor inside of the store. “I’m just glad everyone’s OK,” he said. The St. George Police Department, St. George Fire Department and Gold Cross Ambulance responded to the scene and the investigation into the cause of the crash is ongoing. 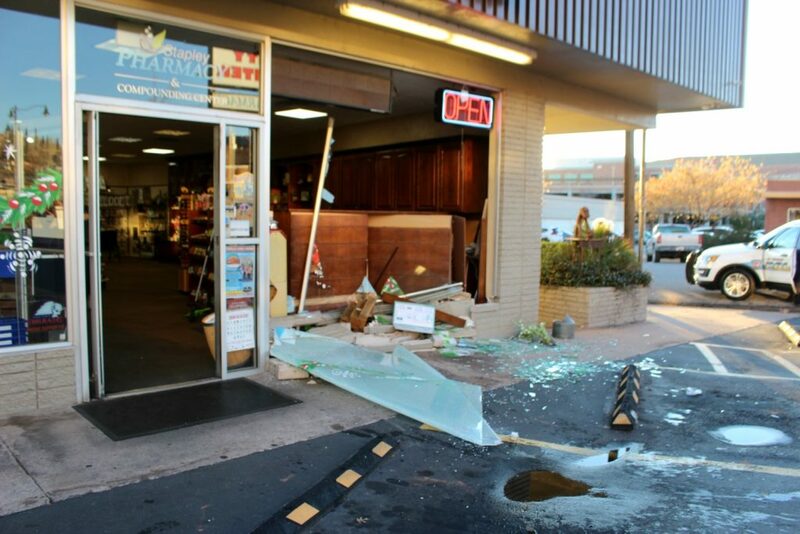 The front of the store sustained extensive damage, and temporary repairs were arranged to secure the building. Another right foot pedal error, part of the right foot braking epidemic? Happens to all ages and gender. But let’s make sure we blame the driver, especially if they are a women or old (over 40!). Never blame the guys in charge of driver legislation and training who set the driver up to fail. They forced this driver to brake an automatic transmission or electric vehicle with only the right foot. They did this knowing they had 0 Scientific Justification and that right foot braking is too complicated and difficult to mentally maintain with age, dangerously inefficient, (poor stopping distance) and even more dangerous, (subject to right foot pedal error) compared to the simpler and safer left foot braking method. See DOT HS 811 597, 812 058 and 812 431 (spaces required). NHTSA refuses to use the term “right foot pedal errors” but instead calls it “pedal misapplication” and always blames the drivers for not being experts. Score to date, 150,000 dead (19 Every Day), millions injured, and billions in costs. The price male drivers, both in and out of government, are prepared to pay to maintain their systemic belief in a “Killer” braking method based on the scientific foundation of, “That’s the way it’s always been taught”! This is not about which braking method is safer but rather why they refuse to scientifically compare the two methods and continue to produce misinformation about other proposed braking methods. Was it driver error or the way we taught them to brake?